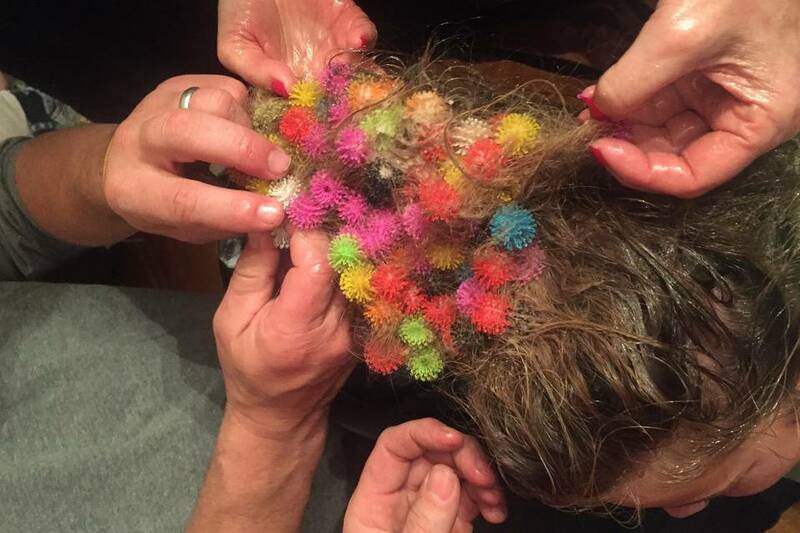 Eight people worked for four hours to extract more than five dozen Bunchem balls from Brooke Kaufman's hair last week. Bonnie Brushwood didn’t think twice when she overheard “Let’s play snowball fight” at her 8-year-old daughter’s birthday slumber party. Her daughter Josie and several friends had just retreated to a bedroom in their Austin, Texas, home with a freshly unwrapped pack of 370 Bunchems, a hot new building toy. Each marble-sized Bunchem has dozens of soft springy hooks that give the multicolored spheres a Velcro-like grip. They are easy to stick together. But hard to unstick from hair. The harmonious giggling quickly evolved into what Ms. Brushwood described as “guttural groaning.” Upstairs she found a Bunchems disaster. There were 30 tangled in one girl’s hair and a couple dozen in the wavy mane of her oldest daughter, Penelope. The other girls were also contending with rainbow clumps of Bunchem balls snarled in their hair. Canadian toy company Spin Master Ltd. said it has received very few complaints about Bunchems getting tangled in hair. Still, it takes the debates unfolding in online reviews to heart. “We look at those as guidance on how to make our product,” says Arlene Biran, vice president of marketing at Spin Master. Bunchems are meant to be used to build things like bears, snakes and unicorns. One attribute Spin Master touts in its television commercial is the toy’s ease for clean up because they all stick together. "Ba da ba da Bunchems, clean 'em up no problem," goes the jingle. The box features a colorful, smiling monkey. But not all parents are smiling. Spin Master has posted a 48-second video on its support page: “How to get Bunchems out of hair.” (Hint: “If they aren’t budging apply a little bit more conditioner.”) More than 15,000 people have watched the video on YouTube since it was posted in August. Introduced at New York’s Toy Fair in February, Bunchems made the top holiday toy list for Target Corp. and TTPM, a popular toy review website, and they’re up for the prestigious Toy of the Year award for best activity toy. Juli Lennett, toy analyst at research firm NPD Group, predicts the $24.99 Bunchems Mega Pack could be the top selling arts and crafts toy for the holidays. Retailers are having a hard time keeping them in stock. 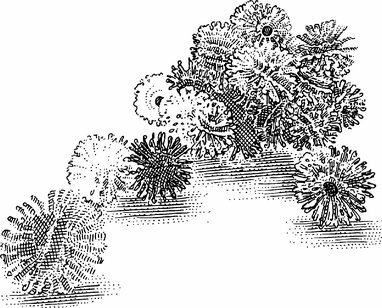 Bunchems was conceived by longtime Spin Master designer Paul Reynolds, who, after walking through a wooded area in Toronto with his daughter, noticed dozens of prickly burs stuck to his socks, Ms. Biran says. Seeing how they easily stuck together, he thought about how that could become an arts and crafts toy that didn’t rely on some messy tools like glue. The toy took three years of tinkering. Like all toys, Bunchems was tested with children. (It is recommended for ages 4 and older.) Most would focus on making aliens or rainbows, but some used the soft balls as projectiles and would get it caught in their hair. Most of the time, the balls would easily slip out, said Ms. Biran. Still, the problem of sticking to hair and other “fibrous materials” came up early in testing. Spin Master includes several warnings. “Caution: Keep Away from hair. May become entangled,” appears on the back of the box and twice in the instruction book. A cardboard strip inside the box with the warning in eight languages is now bright orange, instead of white. “We’re trying to figure out ways to make it more obvious,” said Ms. Biran, who says she has put Bunchems into her hair but has never had them get stuck. Paula Kaufman, of Framingham, Mass., thought her 8-year-old daughter, Brooke, was wearing a rainbow party hat when she picked her up from a play date last week. Instead, there were more than 60 Bunchems in her waist-long hair. The scenes are reminiscent of an episode in one of Beverly Cleary’s “Ramona” children’s books. In an effort to cheer up her dad, Ramona put a crown of burs on her head. They got so tangled in the second-grader’s hair that her father had to cut each one out. Some salon owners are being called to the rescue. Sabra Dupree got her first taste of Bunchems last month, when a 7-year-old girl came into her Kids Kuts Salon in Marietta, Ga., after making a hat of them and putting it on her head. Instead of using conditioners and combs, Ms. Dupree and two other stylists spent the next 90 minutes working the balls out using small crochet hooks. The practice came in handy a couple of weeks later, though it was a smaller case. At the Austin slumber party, the Brushwoods and a neighbor worked for hours to clear all the Bunchems from the partygoers. The balls covered with hair strands went into the garbage, while the rest of the box now sits on top of the refrigerator. But their daughter’s hair is still matted almost a week later and they spend a couple of hours each night combing out tangles.